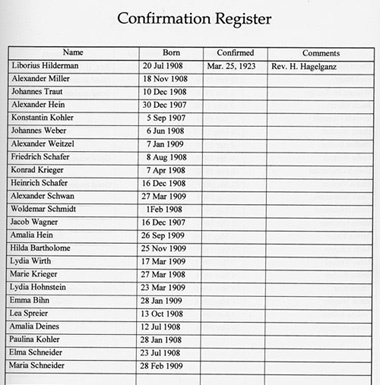 The registers for many of the churches founded in Portland by the Volga Germans have been translated to English. The volumes below are available for purchase from: Joanne Krieger, 3215 NE 135th Avenue, Portland, OR 97230. Telephone: (503) 252-6623. Email: wiljokrgr@gmail.com. The church books for St. Paul's Evangelical and Reformed Church (which was located at NE 8th and Failing) have been lost. Please contact the webmaster if you have any information about the membership of this church. 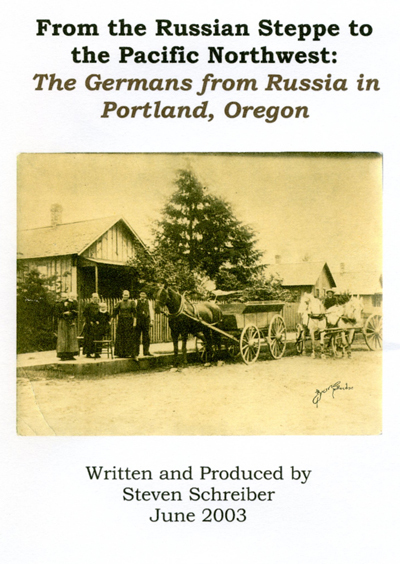 A video documentary titled From the Russian Steppe to the Pacific Northwest: The Germans from Russia in Portland, Oregon was produced by Steven Schreiber for the American Historical Society of Germans from Russia (AHSGR) Convention in Yakima, Washington on June 21, 2003. The documentary has been featured on Portland cable television and is included in the City of Portland's publication titled History of Portland & Oregon - A Selected Bibliography. The documentary is 60 minutes in length and includes a narrative and historical photographs. Watch and download the video here. This documentary is also available for purchase on DVD and for loan through the Multnomah County Library (Catalog No. DVD 979.549 SCHREIBER). Please contact Steve Schreiber for information about how to purchase copies of the DVD. All proceeds benefit the Center for Volga German Studies at Concordia University.